At Insider Monkey, we pore over the filings of nearly 750 top investment firms every quarter, a process we have now completed for the latest reporting period. The data we’ve gathered as a result gives us access to a wealth of collective knowledge based on these firms’ portfolio holdings as of December 31. In this article, we will use that wealth of knowledge to determine whether or not Godaddy Inc (NYSE:GDDY) makes for a good investment right now. Is Godaddy Inc (NYSE:GDDY) a good stock for your portfolio? The number of bullish hedge fund positions decreased by 5 in recent months, however, the overall hedge fund sentiment towards GDDY is still near its all time high that was achieved in September. This is usually a bullish indicator. For example hedge fund sentiment towards Xilinx Inc. (XLNX) was also at its all time high at the beginning of this year and the stock returned more than 46% in 2.5 months. We observed a similar performance from Progressive Corporation (PGR) which returned 27% and MSCI which returned 29%. Both stocks outperformed the S&P 500 Index by 14 and 16 percentage points respectively. Hedge fund sentiment towards IQVIA Holdings Inc. (IQV), Brookfield Asset Management Inc. (BAM), Atlassian Corporation Plc (TEAM), RCL, MTB and CRH also hit all time highs at the end of December, and all of these stocks returned more than 20% in the first 2.5 months of this year. Let’s check out the new hedge fund action regarding Godaddy Inc (NYSE:GDDY). What does the smart money think about Godaddy Inc (NYSE:GDDY)? Heading into the first quarter of 2019, a total of 43 of the hedge funds tracked by Insider Monkey were long this stock, a change of -10% from the second quarter of 2018. 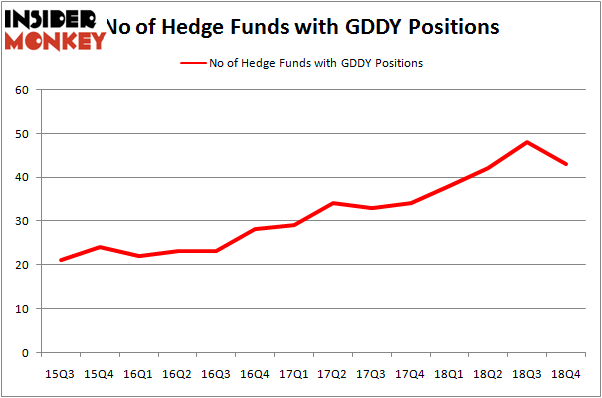 On the other hand, there were a total of 38 hedge funds with a bullish position in GDDY a year ago. With hedgies’ capital changing hands, there exists a few notable hedge fund managers who were upping their holdings significantly (or already accumulated large positions). More specifically, Silver Lake Partners was the largest shareholder of Godaddy Inc (NYSE:GDDY), with a stake worth $345.1 million reported as of the end of September. Trailing Silver Lake Partners was Select Equity Group, which amassed a stake valued at $344.7 million. 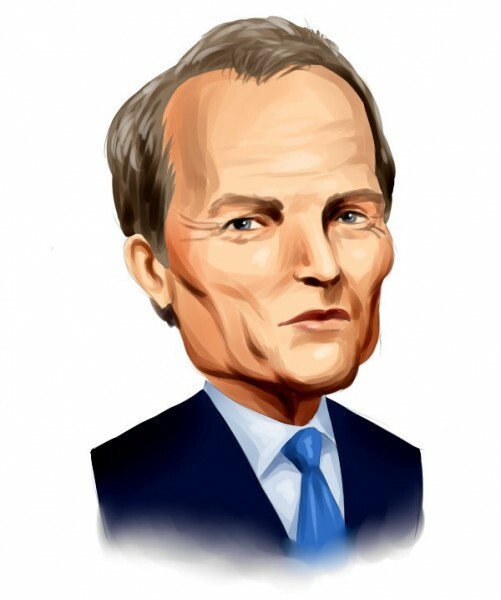 Renaissance Technologies, D E Shaw, and Egerton Capital Limited were also very fond of the stock, giving the stock large weights in their portfolios. Judging by the fact that Godaddy Inc (NYSE:GDDY) has witnessed bearish sentiment from the smart money, it’s easy to see that there lies a certain “tier” of funds who were dropping their positions entirely last quarter. It’s worth mentioning that Benjamin A. Smith’s Laurion Capital Management cut the biggest position of all the hedgies monitored by Insider Monkey, worth an estimated $78.6 million in stock, and Bruce Garelick’s Garelick Capital Partners was right behind this move, as the fund dropped about $33.8 million worth. These bearish behaviors are intriguing to say the least, as aggregate hedge fund interest fell by 5 funds last quarter. Let’s now take a look at hedge fund activity in other stocks similar to Godaddy Inc (NYSE:GDDY). These stocks are Quest Diagnostics Incorporated (NYSE:DGX), SS&C Technologies Holdings, Inc. (NASDAQ:SSNC), The Mosaic Company (NYSE:MOS), and Broadridge Financial Solutions, Inc. (NYSE:BR). All of these stocks’ market caps match GDDY’s market cap. As you can see these stocks had an average of 30.5 hedge funds with bullish positions and the average amount invested in these stocks was $809 million. That figure was $2780 million in GDDY’s case. SS&C Technologies Holdings, Inc. (NASDAQ:SSNC) is the most popular stock in this table. On the other hand Broadridge Financial Solutions, Inc. (NYSE:BR) is the least popular one with only 22 bullish hedge fund positions. Compared to these stocks Godaddy Inc (NYSE:GDDY) is more popular among hedge funds. Our calculations showed that top 15 most popular stocks among hedge funds returned 19.7% through March 15th and outperformed the S&P 500 ETF (SPY) by 6.6 percentage points. Hedge funds were also right about betting on GDDY, though not to the same extent, as the stock returned 14.9% and outperformed the market as well. Were Hedge Funds Right About Dumping Elanco Animal Health Incorporated (ELAN... Hedge Funds Haven’t Been This Bullish On DexCom, Inc. (DXCM) Since 2015... Is Seagate Technology (STX) A Good Stock To Buy? Were Hedge Funds Right About Souring On Vornado Realty Trust (VNO)? Do Hedge Funds Love Lincoln National Corporation (LNC)? Were Hedge Funds Right About Flocking Into Marvell Technology Group (MRVL)?